Baba ganoush is a Middle Eastern dip or spread made from eggplant and tahini. It makes a delicious appetizer or snack when served with pita bread or chips. While you can make baba ganoush and serve it right away, it benefits from making it a day or two ahead of time and refrigerating it. By making baba ganoush ahead of time, you allow the flavors to blend beautifully. The star of baba ganoush is smoky eggplant. Grilling the eggplant gives it a smoky flavor. Prick the skin of the eggplants several times with a fork. Place the eggplant directly on the grill and allow the skin to char, turning the eggplant regularly so all skin chars. Move eggplant to a cookie sheet and bake until it softens, about 20 minutes. Allow eggplant to cool completely. Halve the cooled eggplant and scoop flesh away from charred skin. Discard skin. Place eggplant in a blender or food processor with remaining ingredients. Pulse the food processor for 10 one-second pulses, until it is roughly puréed but still slightly chunky. Serve drizzled with additional extra virgin olive oil and pita bread, flat bread, or pita chips. You can also serve it as a spread for sliced baguettes or crackers. Baba ganoush is a purée, so it lends itself to a number of variations on the basic recipe. Add three tablespoons pine nuts to the purée. Replace garlic with three tablespoons of prepared pesto. Make a smoother baba ganoush by puréeing in the blender or food processor instead of pulsing. Add a chopped roasted red pepper to the mixture. Make it spicier by adding 1/4 teaspoon of your favorite hot sauce or 1/4 teaspoon hot paprika to the purée. Roast the garlic before adding to the spread for a sweeter, milder garlic flavor. For a stronger lemon flavor, add the zest of half a lemon. Replace parsley with chopped fresh mint. Replace half of the tahini with plain Greek yogurt for a creamier dip. Add 1/2 teaspoon smoked paprika for a smokier flavor. Sprinkle with sesame seeds as garnish. Garnish with chopped tomatoes or olives. Sprinkle with a little smoked salt to make a smokier spread. Like many eggplant recipes, baba ganoush is healthy and delicious. 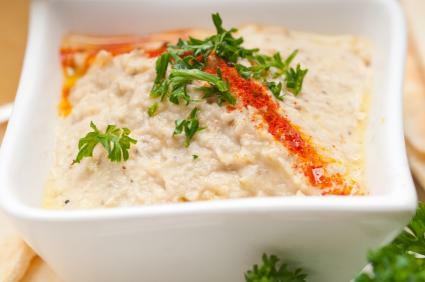 With so many variations, you're sure to find a version of baba ganoush that suits your palate.